With OHSA reporting that 1 in 10 workers are injured on-site every year, safety is a major priority in the construction industry. 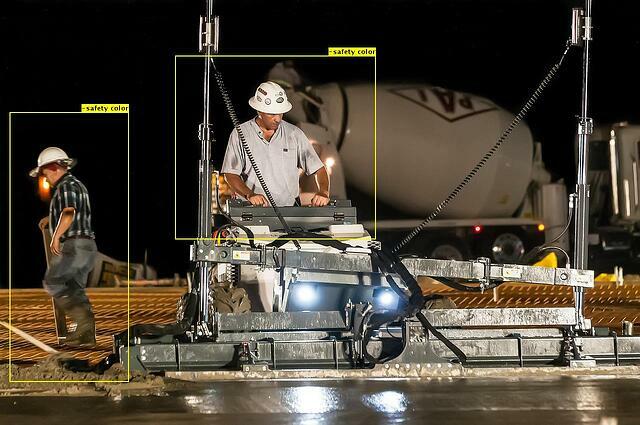 We’re thrilled to have partnered with Engineering News-Record (ENR) for the first-ever Artificial Intelligence for Construction Safety Demonstration to explore the potential AI has to help risk monitoring. Vinnie has flagged potential for missing safety vests. Image courtesy of ENR. Millions of photos are generated each week on construction projects all over the world. What if a computer, trained via machine learning, could “look at” each image and flag the ones depicting workers at safety risk? The goal is not to replace human safety experts, but rather to automate finding scenes showing potential risks and flag them for review, reducing the volume of images that need to be manually checked. Think of it as “computer-assisted” safety. The ENR annual Year in Construction photo contest receives thousands of submissions, all of which are reviewed by safety personnel looking for a few common categories of infractions. In the spirit of other ‘man vs. machine’ events like IBM’s Deep Blue vs. Kasparov, our AI engine Vinnie, for The Very Intelligent Neural Network for Insight & Evaluation, reviewed 2016 contest submissions, alongside the usual human experts. Just like people, machine learning engines are highly trainable, and practice makes perfect. To gear up, we leveraged 10 years of data from ENR, as well as site photos from our customer partners - Suffolk, Skanska USA Building, Rogers-O’Brien, Mortenson & Co, and more - to train Vinnie on “seeing” worksite safety hazards. We started small by identifying photos containing workers, then worked on recognizing workers who were missing hard hats, not wearing safety colors, or both. The results were exciting: Vinnie’s identification took just a few minutes for 1,080 images, and reduced the pool marked for review by over half. The human team required over 5 hours to do the same. As the first public demonstration of AI for safety, the demonstration results show how automated tools like Vinnie can help make safety observation faster and more effective. This is just the beginning. We’d like to thank ENR and our customer partners for all of their help and support in providing data to train Vinnie. Check out our case study highlighting the demonstration, or, sign up for a free demo to start screening your jobsite and other photos for people, hard hats, and safety vests in the live app. Please share ideas for more things you’d like Vinnie to be able to find, and we’ll work on them!